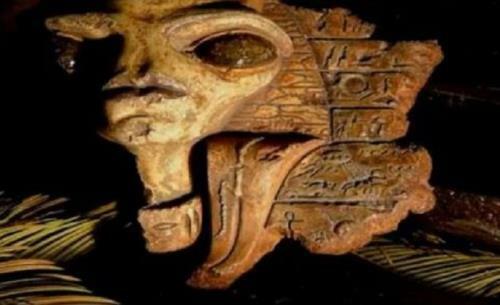 Alien and UFO circles are abuzz with claims of remarkable ancient Egyptian artifacts discovered in the former Jerusalem home of the famous Egyptologist Sir William Petrie, items that “could rewrite ancient Egyptian history” and indeed the history of the world. A YouTube video released by the website Paranormal Crucible purports to show ancient Egyptian sculpture artifacts originally found in the “Giza complex,” but reportedly taken away from Petrie’s Jerusalem home by representatives of the Rockefeller Archaeological Museum shortly after they were found, according to the website UFO Sightings Daily. According to the Shepard Ambellas, editor-in-chief of the “alternative news” website Intellihub News, the alien Egyptian artifacts were discovered hidden in a secret room behind the Egyptologist’s bookcase. Petrie had apparently found proof of extraterrestrial life on Earth before he died in 1942, but chose to hide them away in his Jerusalem home. Now that the Rockefeller Museum has taken possession of the artifacts, alien and UFO pundits fear they may never be accessible to the public. However, Ambellas claims that some of the relics may be seen at the Petri Museum of Egyptian Archaeology in Malet Place, Camden, near Gower Street, London. The Inquisitr was able to confirm that the prestigious Petri Museum of Egyptian Archaeology has in its possession a vast collection of ancient Egyptian and Sudanese artifacts, including ancient Egyptian “firsts,” such as the “oldest linen” and “oldest dress” from ancient Egypt (5,000 B.C.). The museum also displays lion sculptures from the temple of Min in Koptos and the earliest known products of metallurgy from the ancient civilization. However, The Inquisitr was unable to confirm that the museum has on display “alien Egyptian artifacts” recovered from a secret room in Petrie’s former home in Jerusalem. But believers will assume that the more sensitive relics of alien origins are being kept from the public. Ambella claims that the alien Egyptian artifacts allegedly found in Petrie’s former Jerusalem home, which link the ancient Egyptian civilization to an advanced ET civilization, include two mummified bodies less than four feet in height. Although dwarfs and pygmies captured in the interior of Africa were held in high esteem as “celestial beings” in the Old Kingdom era of ancient Egypt and served in high positions, Ambella speculates that these four-foot creatures are “possibly alien in nature,” and thus literally of “celestial” origins. Equally interesting were the “highly advanced” mechanical devices, including a disc of gold with a transparent top found with the alien bodies. According to Ambella, the high-tech devices have “an intricate mechanism which is surrounded by gold spiral tubing that has several small gold orbs and crosses attached to it.” The devices had non-ancient Egyptian symbols on them, as can be seen in the image below. Are these alien interstellar navigational devices? Well, they might be, judging from the fact that the relics also included stone tablets that “appear to show alien spacecraft,” according to Ambella. 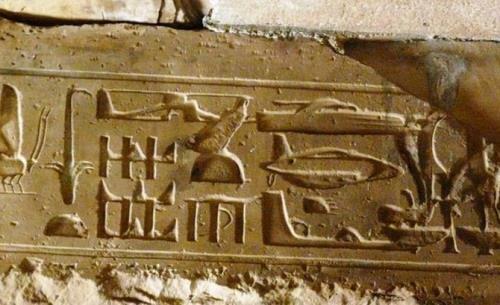 “Helicopter Hieroglyphs” recovered from a temple in Abydos, Egypt, showing what appears to be modern aircraft. 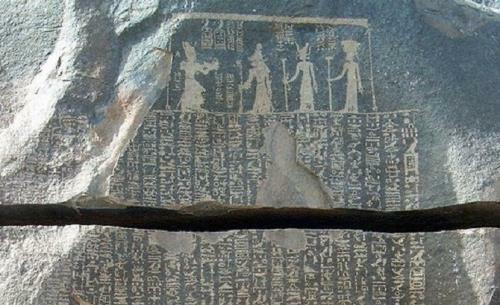 Although scientists have attributed the “aircraft” interpretation of these inscriptions to the psychological phenomenon called pareidolia, the belief is widespread in alien and UFO enthusiast circles that these hieroglyph inscriptions are proof of alien pilots and astronauts who contacted ancient human civilizations and influenced the cultural and technological development of early human societies. And indeed, the precocity of the ancient Egyptian civilization appears to make the alien contact theory credible to ET and UFO enthusiasts, who believe that aliens built such architectural marvels as the Pyramid of Giza long before the ancient Egyptian civilization emerged. But he later denied the widely circulated report. Needless to say, such denials don’t impress UFO and ET believers, who see evidence of “cover up” conspiracies when officials and academics deny revealing statements earlier ascribed to them.